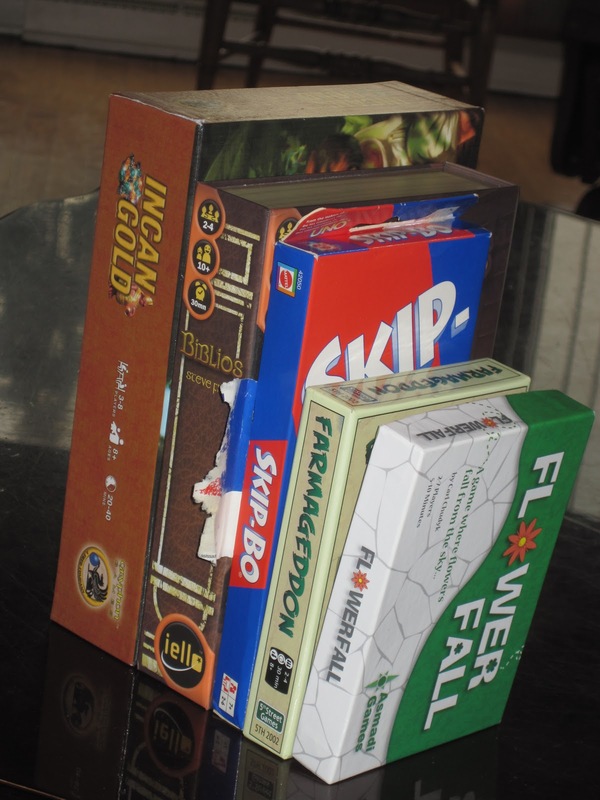 After Origins 2012, I was surprised to hear many people whose opinion I respect say that the game that won the show for them was a small-box affair about dropping flowers. You mean you actually…just–drop flowers? That’s it? When Asmadi Games launched their Kickstarter campaign a few weeks later and I saw the price point was only $15, I knew I had to get in on the action, if only to see what all the hoopla was about. I received my Kickstarted copy early (a first for me–what, no long delays overseas?) and immediately tested it out. But does it float gracefully or fall flat? Find out below! 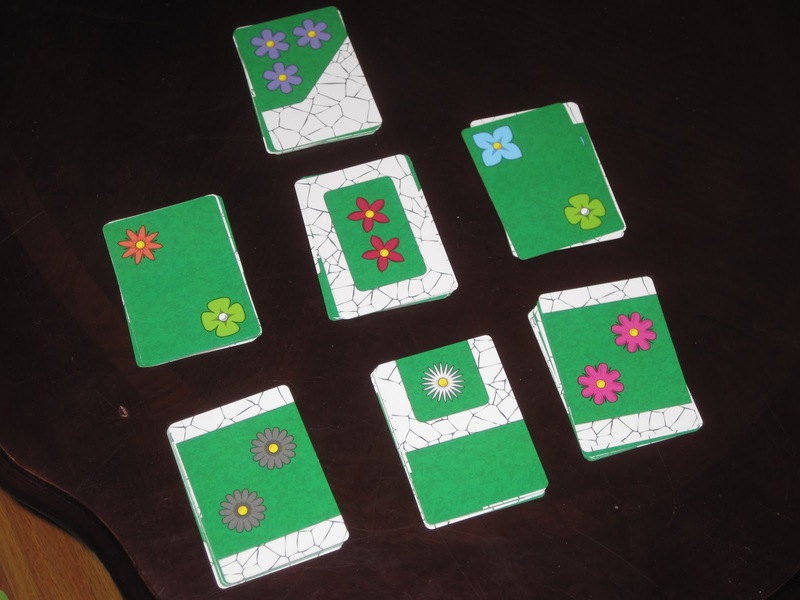 FlowerFall is a card-dropping area-control dexterity game for two to seven players. 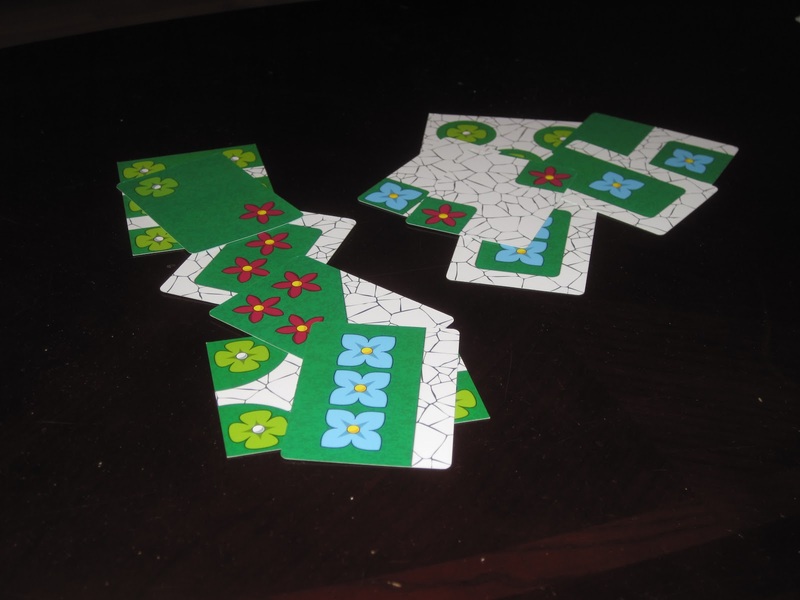 The goal of the game is to score the most points by controlling patches with green flowers. At the start of the game, players toss the oversized starting terrain cards on the surface they’d like to play on. These are three (of four) of the included terrain cards. They are double sided. Each player receives an identical deck of twelve cards in a player color. 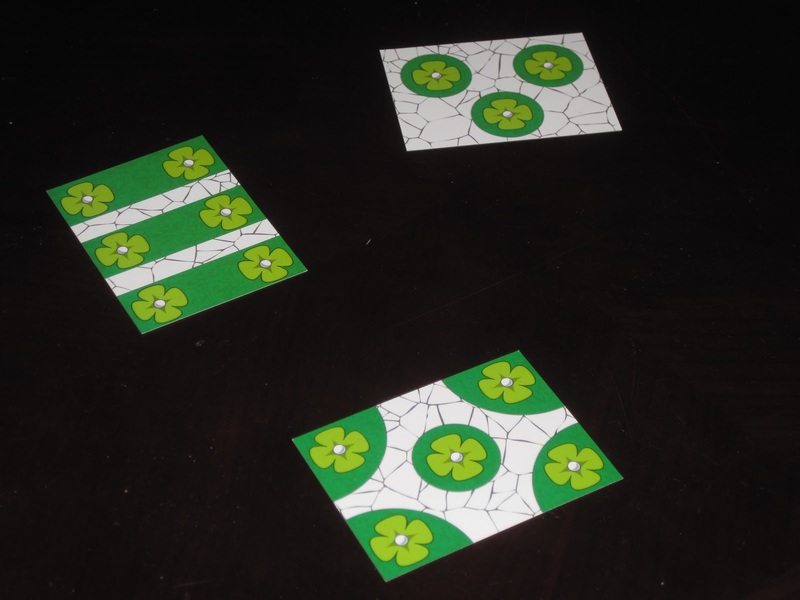 The back of every card features five green flowers completely surrounded by field; the front has at least one flower of the player’s color in some configuration with field, obstructing sidewalk, or green flowers. as well as the green patches and the white sidewalk. Players drop their flower cards until their decks are empty. Points are tallied for each patch in the game, and the winner is the player with the most points. Okay, I’ll admit it: the premise of FlowerFall is very silly. Very silly. 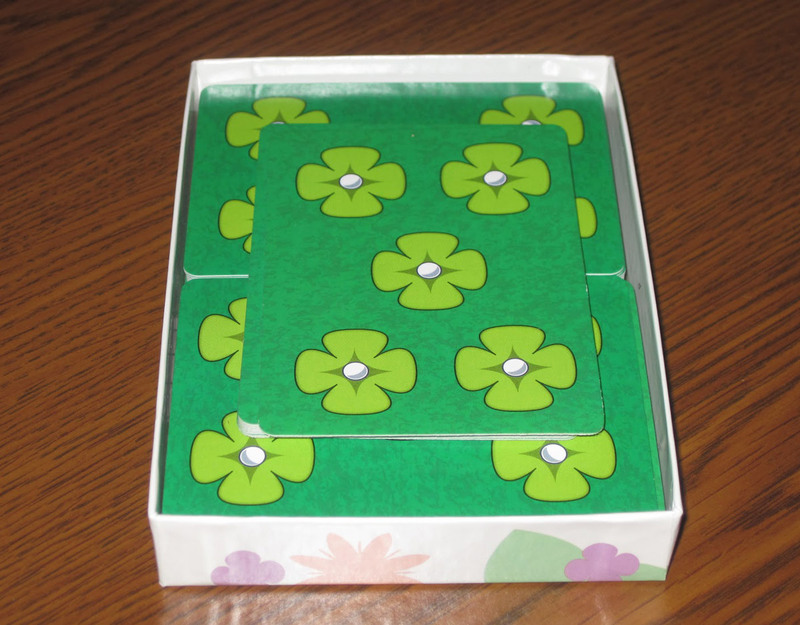 In fact, the day I received the game and taught it to my wife, I had hardly got out, “Okay, you’ll be dropping your flower cards onto the table” before she gave me an incredulous look that said, No wooden cubes? Where’s the glowering medieval? When I confirmed that this was, indeed, how the game is played (and that no merchants or men on horses were in sight), she laughed. But she didn’t just laugh at the rules: she laughed through the whole experience–all ten games we played that night. An example of play. Let’s just say blue isn’t doing so hot. FlowerFall is outrageously fun. It’s the kind of game that doesn’t take itself too seriously and forms all kinds of hilarious situations because most people are not very good at dropping cards. And because the game doesn’t take itself too seriously, it allows the players to loosen up while playing. 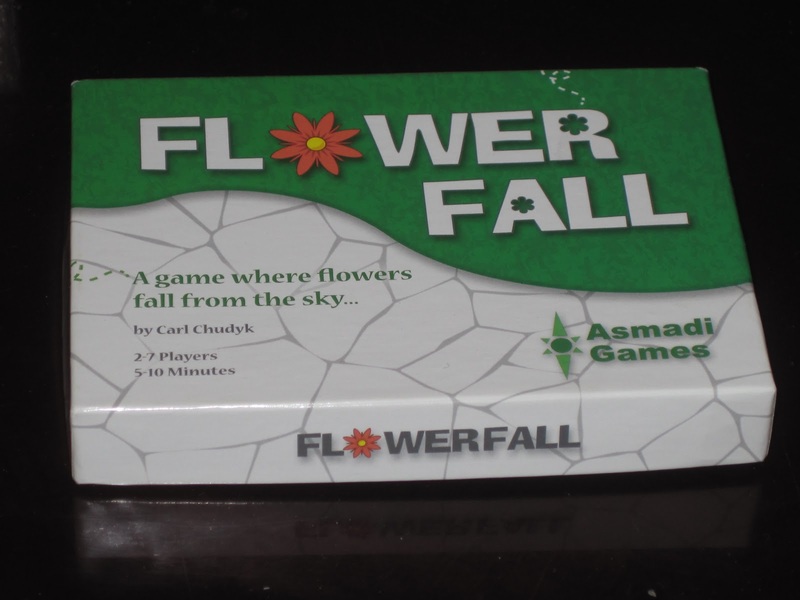 FlowerFall is not a brain-burner in any sense of the word, nor are the components anything to stop you in your tracks. But the game is novel, and while the artwork won’t turn heads, the gameplay almost certainly will. But even though FlowerFall is not exactly a brain-burning game, there are a surprising number of factors to take into consideration on your turn (not least of which is wind speed and direction). You have to try to control patches. Do you go for the most contested patch which will likely be worth the most points but which will require you to waste a lot of your cards? Do you start a new patch in one of the outlying areas? Do you go for the finesse play to cover an opponent’s flower? Or do you not trust your flower-dropping skills? These considerations don’t lend themselves to a full-fledged strategy, but they do offer players choices, and choices that matter. You can see how the size of the FlowerFall box stacks up. It’s the same size as Farmageddon and a little smaller than Skip-Bo. Surprisingly, it makes the Gryphon Bookshelf Series look enormous. FlowerFall will have its haters, no question. Despite the considerations that players can make, the game is light, and your moves are often thwarted by forces outside your control. But to me, the game is a blast, just about wherever and however it’s played. The gameplay is novel enough to keep me interested, but it’s not a novelty in the sense that I think it will grow stale quickly. There really is a fun game here buried beneath the pretty flowers. The winds of fate do not always blow your way. You're literally dropping flowers: this may be a turn-off to some. Previous ArticleReview: Bang! The Bullet!